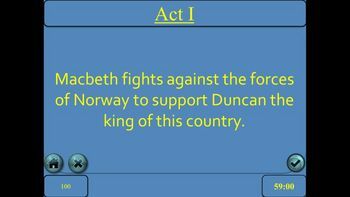 This Macbeth PowerPoint game reviews Shakespeare's classic play. It contains 6 different categories with 5 different questions per category. The questions below each category range from $100 to $500. The categories are: Act I, Act II, Act III, Act IV, Act V, and Characters. Each question is stated in the form of an answer and each answer is stated in the form of a question, like the actual Jeopardy game. The PowerPoint also includes a 60 second countdown-timer on each "answer" slide, giving students a set amount of time to respond with the "question." 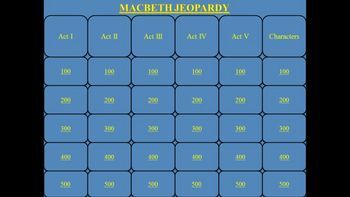 This PowerPoint game is a fun activity to use as a review Shakespeare's Macbeth.